The latest Comet Lovejoy should reach 5th magnitude in late December and January when it will be nicely placed high in the dark for your binoculars or telescope in the northern hemisphere. There is also a possibility the comet could even become detectable naked-eye. A new Comet Lovejoy, designated C/2014 Q2, is heading our way out of deep space and out of the deep southern sky. The object may brighten to 5th magnitude from late December through a greater part of January as it climbs into excellent viewing position for the Northern Hemisphere, high in the dark winter night. 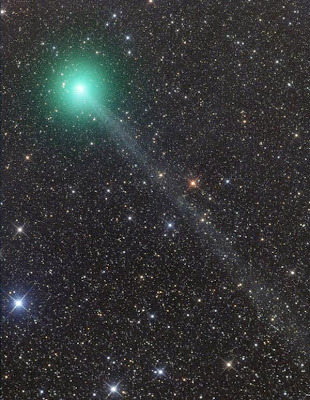 This is Australian amateur Terry Lovejoy's fifth comet discovery. He measured the 15th magnitude "dirty snowball" in the constellation Puppis last August, in search images that he took with a wide-field 8-inch scope. It hasn't moved very much since then, however, it's still in Puppis as of December 11th, however, it's now hundreds of times brighter now at visual magnitude 6.8, reports David Seargent in Australia. On December 9th "I saw it easily using a pair of 6x35 binoculars," Seargent writes. Using a 4-inch binocular telescope at 25×, he says it was a good 8 arc minutes wide with a strong central condensation and no visible tail. In the early part of January, there will be a collaboration between Insight Observatory and Kohout-Dingley Observatory in Kingston, MA (located at the Sacred Heart School campus) for a community viewing session with the recently installed 11" Schmidt-Cassegrain telescope. Please check back on our website for exact dates and time. Source: Binocular Comet Lovejoy Heading Our Way - By Alan MacRobert.